Summer is a great time for families to take day-to-day life at a slower pace and spend quality time with each other having fun. It can be extremely expensive to have a Summer of constant holidays and attraction visits, so we have put together our favourite summer activities you can do at home. Create fun potions and perfumes using flowers and herbs to create different scents. Use jugs, spoons and sieves and discuss the different smells with your child and which is their favourite. 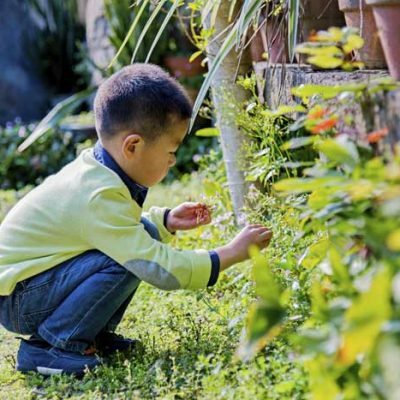 Giving your child something to grow over the summer is both fun and educational for them. Whether you have a corner of your garden they can use, or just use some tubs, plant different flowers and discuss how they will grow with thanks to the water and sunlight. Using either a paper roll or old cardboard boxes, providing your child with some paint, a brush and other items such as sponges, or potato shapes will give them hours of fun. Discuss the different shapes and what happens when you mix the paint colours. Gather a selection of containers and jugs and fill them with water and different food colourings. Let your child mix the different coloured waters and learn how to pour into containers of different capacities. Hide some of your child’s toys around the garden and ask them to find as many as they can. Use the hot and cold method to let them know if they are close to finding one! Using a box or bag, fill it with different objects like cotton wool, feathers, blocks and toys. Ask your child to put their hand in and guess the object they’re touching. Cook some spaghetti and let it cool down before dipping it into different colours of paint. You could also use different pasta shapes like shells or tubes. Put together a mini obstacle course in the garden using tunnels, balls and boxes. Make it into a competition to see who can make it around the obstacle course the fastest. Filling a mini paddling pool can provide endless hours of fun. Use jugs and containers to play with in the water or hold a boat race! Create the boats using plastic trays (the type you get vegetable/fruit in) a lolly stick and some paper for the sail. Whatever you choose to do this summer, have fun and know that you don’t need to be on holiday to make amazing memories with your little one. If you have any questions about the different summer activities you can carry out at home, or how your child can continue learning over the summer, get in touch! Here at the Wandsworth Pre-School, we love to see our children having fun and learning and would be more than happy to share our ideas with you!